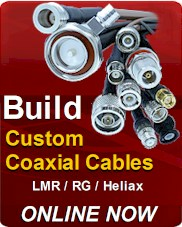 LMR-195-UF UltraFlex Coaxial Cable is an excellent choice for Low Loss Jumper Cable Assemblies. LMR195 UltraFlex weatherability is designed for outdoor exposure with excellent UV resistant and life expectancy over 10 years. LMR-195UF Coaxial Cable is used in many applications that require periodic / repeated flexing making it a perfect choice in short antenna runs. 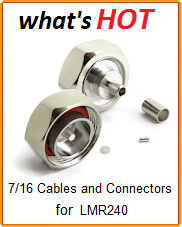 At Field Components we design each cable assembly with best possible performance in mind. Each Custom LMR-195 UltraFlex Cable Assembly is assembled using Adhesive lined Shrink tubing. This enables the Cable assemblies to seal against environmental elements such as wind, rain, snow, and frost. The adhesive lined tubing also adds additional tensile strength to each connector that is terminated on the cable. 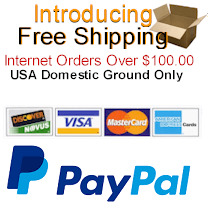 Build Your LMR-195-UF UltraFlex Coaxial Cables Online in 4 easy steps!